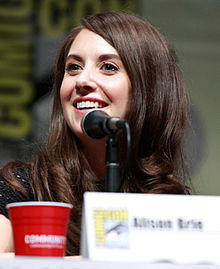 الیسون بری (اینگیلیسجه: Alison Brie) آمریکالی مانکن و اوْیونچو ۲۹ دسامبر ۱۹۸۲ ‏ میلادی تاریخینده کالیفورنیا ایالتینده دۆنیایا گؤز آچیب. ۲۰۰۴–گۆنوموز ایللر آراسیندا سینما ساحه‌سینده چالیشیب. 2011 Robot Chicken Martha Stewart / Vampire Lifeguard Voice role; episode: "The Godfather of the Bride 2"
American Dad! Lindsay Voice role; episode: "Adventures in Hayleysitting"
2013 High School USA! Miss Temple Voice role; episode: "Choices"
Axe Cop Beautiful Girly Bobs Voice role; episode: "The Dumb List"
2014 Comedy Bang! Bang! Herself Episode: "Alison Brie Wears a Black Mesh Top & Mini-Skirt"
2015 Lip Sync Battle Herself Episode: "Alison Brie vs. Will Arnett"
2017 Dr. Ken Herself Episode: "Ken's Big Audition"
2018 WWE SmackDown Herself Episode: "The Road to WWE Extreme Rules 2018 Begins"
2013 ArScheerio Paul Show, TheThe ArScheerio Paul Show Madonna Episode: "Madonna & Rosie O'Donnell"
↑ Alison Brie falls in with the wrongest crowd possible. Comedy Central. ↑ Goldman, Eric (February 4, 2016). Marvel Avengers Academy Launches with an All-Star Cast. IGN. یوْخلانیلیبFebruary 28, 2016. ↑ Smith, Nigel (January 8, 2018). «First-Time Winner Rachel Brosnahan Pauses Globes Acceptance Speech for a Good Reason: 'Hi, Oprah!'». People. ↑ Plaugic, Lizzie (January 8, 2018). «Rachel Brosnahan wins 2018's Best Actress Golden Globe for Amazon's The Marvelous Mrs. Maisel». The Verge. ↑ Otterson, Joe (January 8, 2018). «Mrs. Maisel Star Rachel Brosnahan Advocates for More Women's Stories During Golden Globes Win». Variety. ↑ Perez, Lexy (January 8, 2018). «Golden Globes: Rachel Brosnahan Wins Best Actress for Marvelous Mrs. Maisel». The Hollywood Reporter. اینگیلیسجه ویکی‌پدیاسی‌نین ایشلدنلری طرفیندن یارانمیش«Alison Brie»، مقاله‌سیندن گؤتورولوبدور. ( ۲۱ دسامبر ۲۰۱۷ تاریخینده یوْخلانیلیبدیر). قارداش پروژه‌لرده الیسون بری گؤره داها آرتیق بیلگی‌لر تاپابیلرسینیز.